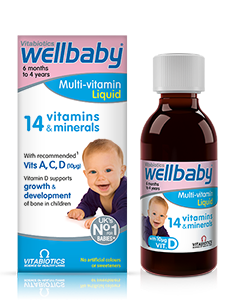 Wellbaby Vit D Drops has been carefully developed by Vitabiotics' nutritional experts, and provides the exact level of Vitamin D for infants and young children, as recommended by the UK Department of Health, in a natural olive oil base. Suitable for infants from birth to 4 years. A baby is born with 300 bones and during the first years of your baby's life the bones are growing rapidly. 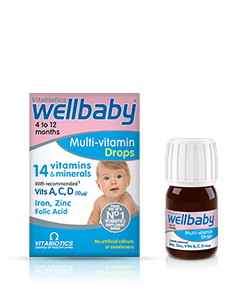 Wellbaby Vit D Drops provides vitamin D (as D3, the body's preferred form of Vitamin D), which is needed for normal growth and development of bones in children. It also contributes to their normal immune system function. The UK Department of Health recommends babies from birth to one year of age take a daily supplement containing 8.5-10µg of vitamin D*, and that children from one to 4 years take a daily supplement containing 10µg of vitamin D.
Wellbaby Vit D Drops contains no artificial sweeteners, colours or preservatives, no salt, yeast, lactose or alcohol and is suitable for vegetarians. A measuring syringe is included in the pack. 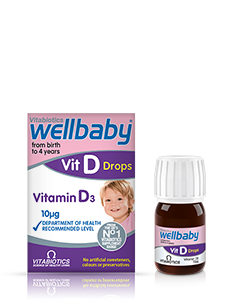 Wellbaby Vit D Drops is available in the UK from larger Boots, supermarkets, pharmacies and health stores. Alternatively you can order online here. Always read the product directions before use. Do not exceed the recommended intake. As with other food supplements, seek professional advice if your child is under medical supervision or suffers from food allergies. Vitamin supplements are not intended to treat or prevent any disease. Food supplements must not replace a balanced and varied diet, and a healthy lifestyle.